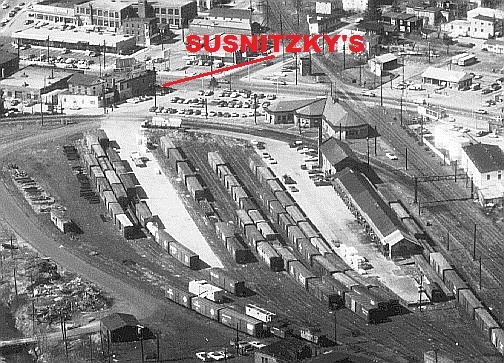 Susnitzky's, a luncheonette/variety store named for the proprietor family during the era of the layout was located in the bottom corner of a two story brick building. I refer to the entire building as "Susnitzky's" only because this was the largest named occupant at the time. This building had one additional store front on the bottom floor and apartments on the second floor, also a large imposing billboard structure on the roof. With this buildings close proximity to the Danbury passenger station a model of this signature structure is a must to complete the station scene on the layout. Like most of the prototype structures modeled within the Danbury diorama portion of the layout the actual structure no longer exists, therefore historic photos for modeling need to be located. First a search online of Danbury historical photos provided no help. 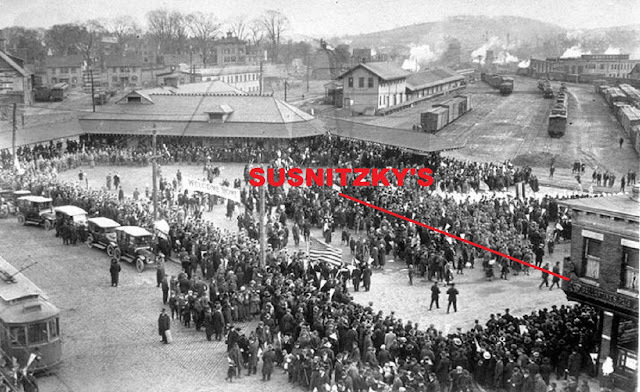 The building that Susnitzky's is located in often appears in the background of photos where a railroad related subject is the focus of the photograph. One example of these photos is below, the building is obscured by the RPO car that is the subject of the photo, but a portion of the roof billboards can be seen above the cars roof providing a hint of that detail. This photo also shows the roof pitch and part of the front facade of the building to the left of Susnitzky's that will also need to be modeled. This next photo shows a street corner view of the building, this side is not seen from the operators isle and will not be modeled in detail. The photo does show the buildings cornice detail and the angled door of the corner entrance to Susnitzky's store front (a tavern in this photo from the WW I era). An online aerial photo from the 70's shows the building and its relationship to the surrounding structures and yard, but to small in the photo to glean any detail. Using the three photo examples above, finding a workable photo that showed enough detail to build a creditable model of the building was very frustrating. Albert Comes to the Rescue! During a visit to the Danbury Railway Museum I noticed a display about the Alfred Hitchcock movie, Strangers On A Train. This 1951 movie has several scenes shot on location at the Danbury passenger station. Watching the movie at home I was able to get a screen shot of the scene below. Although the building where Susnitzky's was located is partially obscured by the station platform cover that was still in place when the movie was made, this view of the building was good enough to be the "blueprint" to build a reasonably accurate model from. More details are also revealed about the building to the left that is on the list to be modeled. This movie was made only six years prior to the era of the layout therefore provides photo information about signage and details that are close as possible to 1957. Thank you Mr. Hitchcock! Leftover 1/4" plywood from the Danbury station model and some dimensional lumber cut to the estimated building height form a solid base for the model stricture in the photo below. The four building sides are each cut from a single piece of .040" styrene. The predominant side that is in view when the structure is on the layout is shown below with the door and window openings cutout. In the next photo cornice detail has been added to the parapet wall at the top of the building, the corbels are ready molded ones from Tichy Train Group. After painting the cornice, the adhesive backed textured brick paper from Micro-Mark is being applied in this photo. The windows and doors are from Tichy, the larger store front window to the right is from a Smalltown USA kit. Pre-painted lintels are glued over the windows and door, sills under the windows, these are made from .010" styrene strips. The billboards and other signage took more time to construct that the structure its self. The billboards taking the most time to build because of the lattice work below and between the billboards. Below the billboards have been assembled with finished lattice in between. Gray paper is in place of where the signs will be inserted, the billboards are made so that the signs can be slid in from the top making it easy to change signs if desired. Below the long lattice that is located under the billboards is being constructed. Equally spaced long strips of .010"styrene that will be the horizontal lattice bars are taped to a glass work surface using a straight edge at the bottom to keep everything straight. Shorter same width pieces of styrene keep the bars equidistant while gluing on the vertical bars. Vertical bars are glued in place one at a time using a same width piece of styrene as a spacer while gluing. This will be the long horizontal sign that is seen on the prototype building in the screen shot from the movie, Coca-Cola button signs will be on each end where the mounting holes are drilled. The fluting at top and bottom are 1/2 round styrene strips. 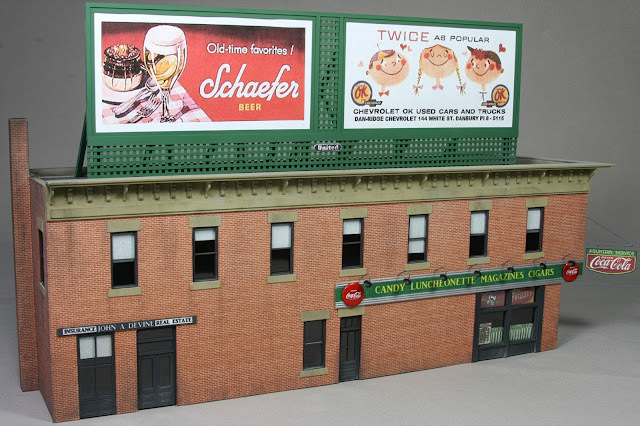 Below is the finished model with all the signage in place, again using the movie photo as a guide to make and locate the building signs. John A. Devine that had the real estate and insurance business on the lower floor left later served as the Mayor of Danbury. The Coca-Cola fountain service sign on the building corner came from an old magazine, it is mounted on styrene and hung by a bracket made from brass wire. The green curtain, tobacco and lunch counter menu signs in Susnitzky's window are all from the net. The OK used cars and trucks billboard sign came from the net, Dan-Ridge Chevrolet once had a used car lot just to the east of the Danbury station. I bought my first new truck from Dan-Ridge in the 1970's. The Schaefer beer sign again is from the net, Schaefer was a New York City brewed beer and a favorite of mine until it was sold to another brewer. "Dave's Old Six" bar & restaurant is the building partially seen to the left in the movie photo, that is the next building to be modeled and will complete the station area scene, hope to get started on it soon. Very nice job on the building Joe. It sure does bring back memories! You captured the essence of the building back when. I never ate there. I always went to the little diner to the northeast of the White Street grade crossing.